Welcome to the third communal Combat Mission skirmish – a comment-driven confrontation between RPS readers and CM’s uncommonly entertaining AI. Turns span 60 seconds and rarely go according to plan. 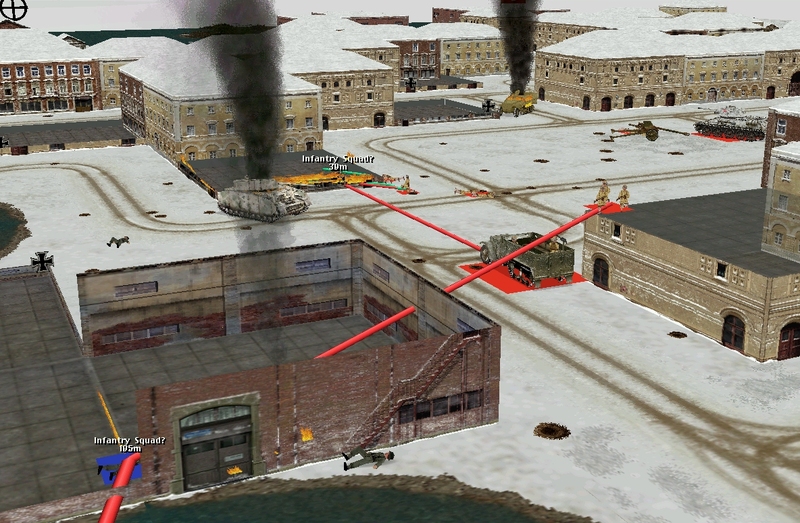 Late-war and Eastern Front, this summer’s scrap takes place in a German-held Baltic port. Twenty turns in, the commenter-controlled Soviets control three of the map’s seven victory locations, and are about to launch a series of bold infantry assaults. At T+0 the town centre is a cat’s cradle of blue movement lines. Having bagged the StuG, Myshkov’s men are advancing westward down both sides of ‘L Street’. At the west end of the square, Lapshin’s platoon have their sights set on p15, a house that must be secured if the wharves are to be reached from West Bridge. Of more immediate concern is Lapshin’s 2 Squad. Halted a few strides from n17 by a chattering MG 42, this relatively inexperienced unit (they’re ‘regular’ rather than ‘veteran’) fails its first real test. Instead of pushing on… attempting to even the odds with grenades and molotovs… they flap and flee, scampering back to the relative safety of the gun pit at p18. Moments after the unnerved Ivans go to ground they are showered with woody confetti. A swarm of spherical hornets has scythed through the branches overhead. The OT-34 is firing canister shot at the HMG as it moves into the centre of the square. Deflamed by a Panzerfaust hit/crew casualty early in the battle, Flare Path may not be quite as ferocious as she once was, but she’s still a force to be reckoned with. Hit by three outsized shotgun blasts in quick succession, the MG 42 and its crew are torn to pieces. There’ll be no more unearthly jay shrieks from n17 today. Lapshin probably doesn’t notice the fate of 2 Squad. He’s far too busy organising the assault on p15. At the western end of the square things start going slightly awry early in the turn. First the BA-64 runs out of ammo, then 1 Squad, tasked with covering the attack, find themselves firefighting with units in the warehouse across the street. With help from the spit AT gun, the threat is suppressed quickly, but not quickly enough for the advancing recon squad. Bound for o15, the unencumbered scouts outstrip Lapshin’s troops, and, consequently, catch the worst of the defensive fire from p15. ^ Above West Bridge (click to enlarge). Lapshin’s HQ has lost a man, the squad to his right is ‘pinned’, and the nearby scouts have routed. ^ ‘L Street’ and environs (click to enlarge). Myshkov’s men advanced without incident. The StuH huddles in a gateway at g24. Either it’s lost its nerve or it’s heard the sound of approaching Sturmoviks.